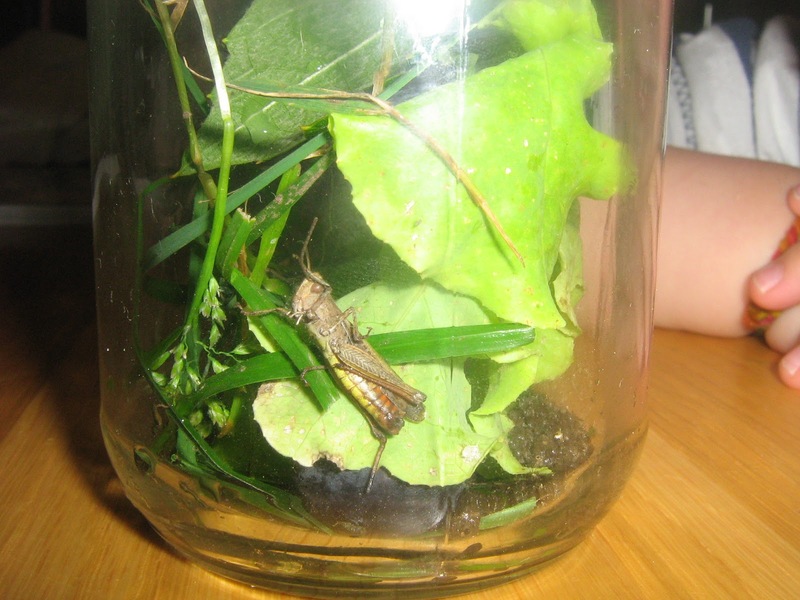 A few weeks ago Amy and her other homeschool friends were playing at our home, when they asked me for a jam jar and lid...to collect grasshoppers! I gave them what they asked for and the girls all skipped off to find themselves some grasshoppers. Meanwhile my sleepy little boy was tucked up in bed for his lunchtime nap. 'Pippa and Piper' - Amy and Dylans Grasshoppers! When he awoke our guests had gone home but Amy began to tell him about catching grasshoppers...he was very excited by this! Amy agreed to take Dylan down to the polytunnel to try and catch him some grasshoppers. They where gone for twenty minutes or so when Dylan came bursting in the door to announce that they had indeed caught some 'pet' grasshoppers! I helped the children set up the 'habitat' based on internet research that Amy did and Dylan watched them for a looong time! ...And yes we did set the little guys free eventually back into the garden! Wow, those are big grasshoppers!!! Thanks for your comment on my blog. It is nice to know I am not alone!